WHY DID WE GO BACK TO APPOINTMENTS ONLY ?? This was to discourage tire kickers & people who still need permission from the wife to buy. Now that we are closed to the public, we finally are able to retain a small semblance of sanity. We can control how many people are here at once & therefore do a better job of servicing our good customers. We believe it's good to make new customers! We believe that our old customers are responsible for our many years of success and they are to be taken care of first & foremost. That's why our website is as big as it is. So our potential customers can see what we do. It was overwhelming to most of them when they walked in to browse anyway. Invariably they could not take everything in. Generally they would find numerous guitars they wanted to buy. (But which one?) therein lies the major problem. This caused us to actually lose sales!!! The average customer could not make up his mind and therefore he would spend hours looking and simply walk out confused. This is the main reason chain stores don't give you much choice, They generally have only one high end choice and usually they are not really high end at all. Chain Stores are cold & calculating. They have zero passion for guitars and they simply do everything by the book and of course they succeed financially. If you are really into guitars and you want to offer your customers real selection and real quality you do yourself a disservice. In fact you confuse and befuddle many of your customers so they cannot make up their minds. They go into sensory overload and buy nothing. The customer simply goes out to a chain store and buys a cookie cutter Gibson. (Why ? Because it's easy and requires no actual thought process) This is something people do subconsciously, fueled by all the advertising and the confusion he went through in his short search for something better. You can read sales psychology tactics and it will explain the whole process. If You Don't Believe Me Just Walk Into A Guitar Center !!! Perhaps the most important reason is we were growing tired of getting approximately 150 people a day into the store who had absolutely no intention of buying anything. These people would often say as they left, "Cool Store, If I ever buy a guitar it will be from you" OR "I would buy that guitar in a heartbeat but my wife would kill me" OR "I'm getting some money in a couple of years, do you think you'll still have this in stock?" I could go on here for about 20 more paragraphs but I think you get the idea. Our sales have increased dramatically the very first month we went back to appointment only. I've had well meaning people compliment me to the point of telling me the store was the highlight of their Las Vegas Vacation. That is the worst thing I can hear !!! This is just their way of apologizing to me for them not buying anything. Years ago I took statements like that as compliments, these days I dread hearing statements like that because all they are really saying is they are not buying jack squat. Occasionally, I will get a call from one of these people who will again thank me for taking them thru the shop, demonstrating several guitars for them, and posing with them for a picture. Invariably they will have a couple of questions and usually some more compliments but very rarely will one of these turn into a sale. The calls that I like are the ones where the potential customer has read the website, decided that some of the things we had to say made some sense and simply places an order for a guitar. These people have rarely been to the store at all. The worst of all is the potential customer who calls and says he will be in town in 4 weeks and wants to stop in and buy a guitar. These customers' plans usually change, they usually don't actually ever even show up and if they do they were in the buying mode 4 weeks ago when they picked up the phone and called. Invariably they already bought something in the week following the call. I am no longer allowing those callers to make appointments that far ahead. In fact I encourage them to buy a guitar on the spot and tell them if they don't like it they can return it when they are in town. We reduced our overhead by 70% the very first month we made this move. The savings to our bottom line has been awesome. Because we have been in business for 38 years we have no shortage of long term loyal customers. We have not advertised anywhere in almost 6 years to speak of. We might even run a few ads now that the cash flow is back to what it was when the economy was good. 5. Mo Money Mo Money Mo Money !!!! Let's not lose sight of the reasons we are in business for in the first place: to make a profit and be able to feed our families. Going into the second month of our "appointment only" mode our sales volume has increased dramatically. We are selling more volume and our repairs seem to have doubled. In fact I had to hire another full time tech for repairs. We have 3, not counting full luthiers & assemblers. Those maggots can go harass Guitar Center, scratch up their inventory, steal knobs, tremolos, and basically drive them crazy playing "Stairway To Heaven"
There are a few reasons it's good to have the store. In some ways we will suffer some lost acquisitions. The main thing the store was good for was for buying used guitars and doing trade ins. We have noticed that the volume of used guitars coming our way has slightly dwindled. So it looks like we will be doing guitar shows again to replenish our used guitar inventory. We can now afford to pay higher guitar show dollars for used guitars because the overhead has been reduced to a minimum. Another reason that the appointments have greatly reduced our ability to get rid of cheapo kids guitars. Those sales are the ones that stores like Guitar Center thrive on. When we first opened our doors in Las Vegas we had been strictly by appointment for 5 years at our Connecticut location. We had more than 2000 cheapo under $400.00 guitars that we had accumulated over a 6 year period. We figured we could easily raise half a million just by selling these used kiddie guitars that we had basically written off anyway. We could almost have burned them as firewood and still be ahead of the game. Sometimes I wish I had done that. 3. People Are Bashing Us For Going Back To Appointment Only !! We are not strangers to being bashed. We have been anonymously bashed for years. We have probably lost some sales due to it but - except for 2007 & 2008 - we always had more business than we could effectively handle anyway. When we moved we didn't even have an official sale. Business was actually decent right up to the last day we were there. 4. Our Competitors Are, As Usual, Telling People We Went Out Of Business?? Screw them & Screw their lying commissioned employees too. With our reduced overhead we can undersell them and still make more money than them !!!!! One of the reasons we have the best selection of cool guitars anywhere is we reinvest our money into buying the newer and cooler products. This was to discourage Looky Loos, Tirekickers, Timewasters & Geeks a 'Gawkin !!! WE ARE NOT A MUSEUM !! 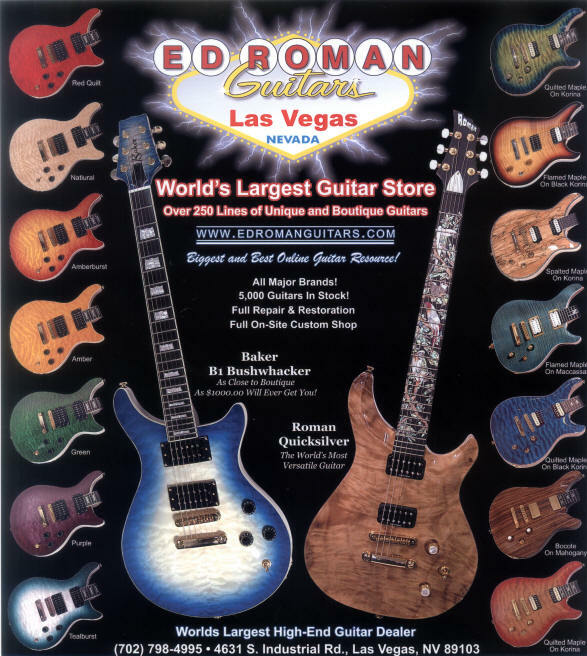 We Do Want To Open A Guitar Museum in Las Vegas !!!! within 2 minutes of the richest part of the strip !!!! We also have about 50% of the initial exhibits bought and paid for. We still need an investor or investors to help with the build out and initial set up. If you are interested in getting involved please call Ed Roman.